Five seems to be the magic number for SSD Midge. She went to the Palmyra Animal Clinic for an ultrasound on Thursday, and the vet saw five puppies! Midge was bred to a handsome black lab named Elton from the Guide Dog Foundation for the Blind. We can't wait to meet their puppies and watch them grow! Thank you to the vets at the Palmyra Animal Clinic for taking such good care of Midge while she was there! As the weather warms up, we all like to spend more time outside, and its only natural that we want our dogs to enjoy the nice weather, too. But along with the beautiful sunshine and warm weather come several dangers for our canine pals. Here are 6 safety tips so that you and your dog can enjoy summer. 2. Always bring lots of fresh water for your dog. When temperatures rise, you dog may need to drink more. Always carry extra water for him. You can also use the water to cool him down if you notice your dog is getting overheated. 3. Find a shady spot. If youre working in your backyard or if you travel to the beach or some other fun destination, always make sure that there is a shady spot for your dog to rest and get some relief from the sun. If there is no natural shade available, make some! Set up a tarp or tent. 4. Avoid strenuous exercise on hot days. Try to avoid taking your dog outside for playtime or other exercise during the hottest parts of the day. Its very easy for your dog to overheat. Instead, enjoy the cooler mornings and evenings together. We understand, though, that it may not be possible to completely avoid going out on hot days, especially if you have a working dog. 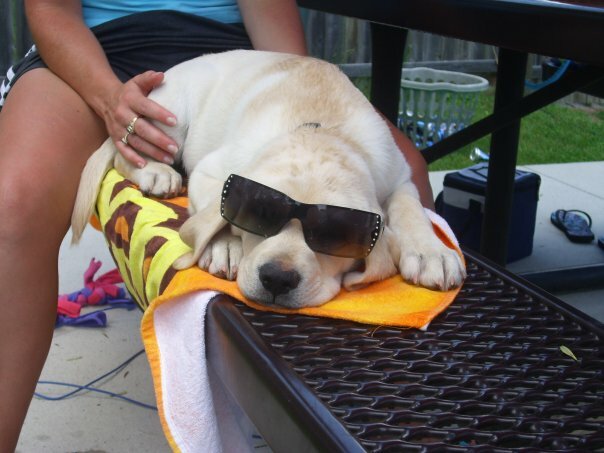 If you must go out, have plenty of water for your dog, try to stick to the shade, and avoid walking on hot pavement. 5. Always supervise your dog while swimming. Many of our labs love to swim, and summer is the perfect time for it! Just be careful to always supervise your dog while hes swimming. Its hard work to swim, and you dont want your dog to overdo it, especially if he loves the water! Also, if you take your dog to the beach, be wary of ocean tides and dont let your dog drink sea water. 6. Avoid fertilizers and other chemicals. This is the time when many people use fertilizers on their lawn, flowers and gardens. While that might be good for the plants, it is not so good for your dog, especially if he has a tendency to eat grass. If you think your dog may have walked through fertilizer, be sure to wipe his paws so he doesn't lick them and ingest it. If you think your dog has eaten fertilizer, call your vet (or the puppy coordinator, if you have an SSD dog in training). If you have other summer tips, please leave them in the comments. We hope youre enjoying the warmer weather as much as we are! Have fun and stay safe with your dog! On Friday, we held our annual graduation and volunteer appreciation celebration. Ten service dog teams and two demonstration dog teams graduated. We also recognized our two new breeding dogs, SSD Opal and SSD Scotia, as well as the two dogs that are now working for the Bureau of Alcohol, Tobacco, Firearms and Explosives (ATF), Hawk and Sunshine. Congratulations to everyone who graduated! It has been quite a journey. We also recognized all of our wonderful volunteers – puppy raisers, the Puppy Raiser Council, puppy sitters, puppy huggers, breeder caretakers, the whelping team, volunteer trainers, team training volunteers, office assistance, demonstration volunteers, PawsAbilities volunteers, Summer Camp volunteers, Black Tie & Tails volunteers, home visit volunteers, canine therapeutic evaluators, retesting volunteers, Vision Quest volunteers, work weekend volunteers, Keystone Therapy Dog volunteers and our volunteer liaisons. Your dedication and support makes all of this possible! Every year, we have a keynote speaker. 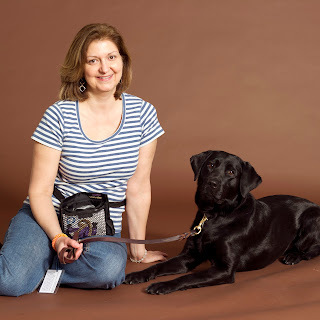 This year’s keynote speaker, Gina Battaglia, gave a lovely speech about her facility dog, SSD Jasmine II, and how Jazzie, as they call her, has made a difference in the lives of her students. We have included her speech below, and we encourage you to read it. It is truly heart-warming. I’m a social worker in an intensive therapeutic program for special education students in a small, rural community in upstate New York. I work primarily with elementary school kids who struggle with social, emotional and behavioral issues. Our program is located in a regular, district-based school, but our students can come from eleven different districts within our catchment area. So our kids are away from their own schools, friends and families when they are with us. We sometimes feel like a little group unto ourselves, watched from afar by the school community with interest and curiosity. People are polite to us, but no one really stops to chat or interact too much with us or our students. We sometimes don’t feel a sense of real belonging in the district. But that all changed the day Jazzie came along. Actually, it all changed when word got out that Jazzie was coming. And I am absolutely not kidding you! The school staff started to visit us at the end of each day to ask about the progress I was making getting “our dog.” The PTA and local Rotary had a fundraiser to help pay for Jasmine. I put a giant poster of a black lab up on the wall by the main door of the school with a big banner that said Coming Soon!” and at dismissal, the kids would actually stop and talk to the poster and pet it. I saw several children kiss the poster and say “I love you!” while touching it gently. Jasmine had already started to make us more a part of the school just by the anticipation of her arrival. It was really stunning. I remember thinking, “Wow! If this is the reaction she gets when she’s not even here, what will it be like when she arrives?” I had no idea! The first day Jazzie came to school, I brought her outside to greet the buses. Big mistake! It created a riot! The kids swarmed her and all I could hear was “I can’t see her! Let me see her! What’s her name? Can she come to my room? Jazzie! I love you!” I was worried that she would panic and be afraid. But there she was, in the middle of the crowd of kids, wagging her tail and licking everyone to squeals of laughter and delight. The magic had begun. After that, the students in our program became the most envied and popular in the school. Everyone came down our hallway hoping to get a glimpse of Jazzie. All the teachers wanted us to visit their rooms and talk to their students about what Jazzie does. Every day for a while, I would take one of my students with me, treat pouch and all, and that student would present Jasmine to an entire classroom of kids, demonstrating clicker training and telling them how Jasmine helps them feel better in class, be happier during the day when they are sad, licks their faces if they are crying and lies down on the bean bag chairs with them while they read to her, her head in their laps. You have to remember, these are kids who often have extreme anxiety, low self-confidence and many worries which distract them throughout the day. Our special education classes are very small. We never have more than six students in a class in order to minimize anxiety and better address individual student needs. Suddenly, our little cluster of anxious kids was talking in front of groups of 21 or more peers and adults with a confidence I had never seen! They now stop and talk with teachers and high school students as they walk in the hallways with Jazzie because they feel so proud of her and confident with her. Jazzie gave that gift to them. There is no way, as their counselor, that I could ever have instilled such confidence and pride in those kids so quickly and effectively, if ever. That is the miracle of Jasmine! One day, I was walking into school a tad on the late side with Jazz trotting along. The buses were just pulling up to the loop. Suddenly, I heard the sound of bus windows going down all around the drop off area and kids started chanting “Ja-ZZIE, Ja-ZZIE!” with their arms waving out the bus windows. Jazz and I stopped and looked at each other. I think she was as surprised as I was! She had achieved “rock star status!” We ran into the building as fast as we could to avoid being mobbed. It was official. She had won the hearts of the entire school. Now, with “rock star status” comes a certain amount of privilege. Jazz had earned the reward of being allowed to walk next to me in school without her leash. She is good about staying right with me – usually. The following story is a reason why you cannot become too comfortable in assuming that your service dog will always listen to you. We have a door on the lower level at school that leads outside to the playground. It is usually closed, but it was a particularly sunny day and it was dismissal time. The teachers left the door open so the kids could go in and out to play while waiting for their buses. Remember that Jazzie had earned off-leash privileges now. You can probably see where this is going, right? I had been so proud of Jazz walking by my side and paying such close attention to me. I did consider that if she saw a better offer, she might go for it, but that would be okay because there is nowhere she could really go in the building. I could easily get her. Well, she and I both noticed the open door to the sunny day at the same time. I saw the look in her eyes and I knew it was the better offer. As I was saying “NO, JAZZIE!” she was already bolting down the hallway, through the doors and out onto the playground. But did she stop there? I wish! I really should have had my treat pouch and clicker. Lesson learned! Then I realized there was a crowd of about 150 elementary school kids running in a pack behind me, screaming her name and laughing. It must have looked hysterical. I turned to face the throng and with arms spread wide, yelled, “STOP RUNNING!” You know what? They did! And when they did, Jazzie did. She just stood there, panting and looking at me bewildered, as if to say, “What?” I walked up to her, grabbed her collar and marched her back to the school. Her head was down. The kids all tried to pet her, but I kept going without saying a word. I heard a teacher say quietly, “You’d better just let Mrs. Battaglia get her back into the school. I think Jazzie might be in trouble.” After that, Jazz was back on her leash for a while. So be ready. Your dog may get a better offer someday. We’ve used Jazzie in many learning situations. Once, I had one of the staff members “kidnap” Jazzie, and I hid clues all around the school so the kids could use their problem solving strategies and team work to find her, which they proudly did. She has walked scared kids to their mainstream classes and stayed with them while there. She has been the “prize” in a monthly drawing (a training session with Jazzie), with tickets earned for showing good character. She has been loved and kissed and cuddled and has brightened everyone’s day just by being herself. She has provided a fun way for kids to learn about themselves, each other and the world and to learn compassion, caring and responsibility. She is an amazing little princess who has given of herself in a gentle, sweet manner that has made all the difference for an entire school. Thank you, everyone, and congratulations, graduates! Today, several people are meeting the dog that may become their service dog! Here at Susquehanna Service Dogs, we go to great lengths to match each person with a dog and make sure that the service dog team is successful. This matching process starts with Meet the Dogs. Once a person has completed the application process and has had a home visit, they’re placed on our waiting list until we have one or more dogs that meet their needs. The waiting list is necessary because we may not have a dog in advanced training that meets their needs. For example, if a person needs a balance dog, we cannot invite them to Meet the Dogs until we have a potential balance dog available, even if that person is at the top of the waiting list. Not all dogs are suited to every type of work, and in the case of balance dogs, it takes a very specific set of skills and attributes for a dog to be suited to balance work. When we have one or more dogs that fit a person’s needs, that’s when we give them the call – the call to come meet their potential service dog. Before people even meet any of the dogs at Meet the Dogs, we spend some time talking with them about their needs and wishes. Our goal is to find out how the dog would be able to assist them. We go through a list of daily activities that are made more difficult because of their disability. A person can have more than one disability. For example, they could have a psychiatric disability, a balance issue and a hearing issue. We ask them questions and have them rate the difficulty of performing each daily activity. From their answers, we come up with a list of behaviors and tasks the dog can be trained to do to mitigate that person’s disability. Six months after a person has been placed with their service dog, we come back to these answers and ask them the same questions. This time, we have them rate the difficulty of performing daily tasks with the assistance of their service dog. This way, we can evaluate how effective the dog is. At Meet the Dogs, we talk about clicker training and the treat pouch, as well as the types of dogs the person likes. We want to get an idea of the type of personality the person is looking for in a dog. For example, we might think that a dog is great for a person, but if that dog loves to give kisses and that person doesn’t like dogs that lick, the match isn’t going to work. After we spend some time talking with the person, they get to meet the dogs. Each person meets at least two dogs, one at a time. One of our volunteers brings a dog into the room and the dog and person have a chance to greet each other. The person gives the dog treats to get the dog to focus on them. Then the handler moves the dog away from the person, and we have the person give the dog a series of cues. First, the person calls the dog to come, and they click and treat as the dog is on its way. The person also asks the dog to sit and down, and then they have the chance to just hang out for a little bit. During this process, we observe both the person and the dog. We look at how the person does with clicker training, and how the dog and person react to each other. We look at whether the dog wants to stay with that person and whether the dog is focusing on the person or the treat pouch. Then we have the person and dog move around the room, whether the dog is walking on a leash, wearing a balance harness or walking beside a wheelchair. We make it clear right from the start that the person is not going to pick the dog. However, they do have an opinion in which dog they get. After the person goes through this process with a second dog, we ask them which dog they liked better and why they liked that particular dog. We also ask why they didn’t like the other dog as much. These questions are similar, but the answers give us great insight into the potential match. Each person answers these questions about each dog they meet. We also ask the person if there was a dog that they absolutely would not be able to work with and if there was a dog that they would be able to work with, even though it may not be their first choice. We always video these sessions because we learn a lot about how we’re going to continue a dog’s training for that person. Each dog is trained specifically for that person. For example, if a person’s wheelchair needs to have a special hookup for the dog, we can duplicate it in training. We also look at how a person may have to deliver treats to the dog. Will the person be handing the treats to the dog, will they be pushing the treats onto the floor or into a bowl, etc.? If a person walks with a certain gait, we video that as well and try to duplicate it in the dog’s training. Our goal is to prepare the dog to be successful with their partner. We let each person know that we can train the dogs to do certain skills. Many people are surprised by the things that a service dog can be trained to do. We always ask people if certain skills are something that they would like the dog to be able to do. Although people go through the matching process at Meet the Dogs, they aren’t actually matched with a specific dog until later. We take time to review everything we learn at Meet the Dogs so that we can make wise decisions when pairing a dog with a person. We need to match the right person and dog, as well as match the right dog to the job they will need to do. For example, if a person needs a hearing dog, we will give them a dog that enjoys alerting to sounds. That way, the dog will wake up in the middle of the night and alert their partner when the smoke alarm is going off, or they’ll wake up their partner when their alarm clock is beeping. Matching the dog to the job makes training very easy, and makes for a happy service dog. Once we have a match, we notify each person. We don’t always let them know which dog they’ve been matched with because the reality is that not all dogs make it through the program, even once they get to advanced training. We don’t like to get someone’s hopes up about a specific dog, only to have to tell them that that dog has been released and they’ve been paired with a different dog. If a person is not matched with a dog, they will be invited to the next Meet the Dogs if we have a dog that may meet their needs. Our matching process is one of the things that makes Susquehanna Service Dogs unique. We’re very meticulous with our matching process. We want each person and dog to become a successful team. Some of you may remember SSD Winter as the mother of the Royal litter (Caspian, Aladdin, Philip, Kiara, Snow White, Aurora, Cinderella, Kida Rose and Jasmine) and the Crayon litter (Shamrock, Denim, Slate, Lavender, Onyx, Rusty, Sienna, Jade and Copper). In fact, SSD Denim, Lavender, Shamrock and Slate will be graduating tomorrow! Winter gave us some wonderful puppies, and now she’s a demonstration dog for SSD. Our demonstration dogs are trained in many of the service dog skills, such as how to pick things up, how to alert to sounds and how to open doors. Winter’s favorite skill is turning on light switches! SSD Winter loves doing demonstration work. She has a sweet, loving personality and enjoys showing off for people. But she does know how to relax, too, spending a lot of her time snuggling on the couch. Demonstration dogs are ambassadors for SSD. They visit schools, clubs, churches, and other groups to demonstrate what service dogs do and how they can assist people. We have a wonderful group of volunteers who do these demos and take care of demonstration dogs. They can tailor the demonstration to the needs of the group that requested it. If you or your group would like us to do a demonstration, please contact Vikki Lagaza at vlagaza@keystonehumanservices.org. As a puppy, Winter made friends with some otters at the zoo. Today, SSD Winter works as a demonstration dog. It’s May 2, and you know what that means? Eighteen days until the Highmark Walk for a Healthy Community! Susquehanna Service Dogs is one of 40 organizations participating in the Highmark Walk, and we need your help! 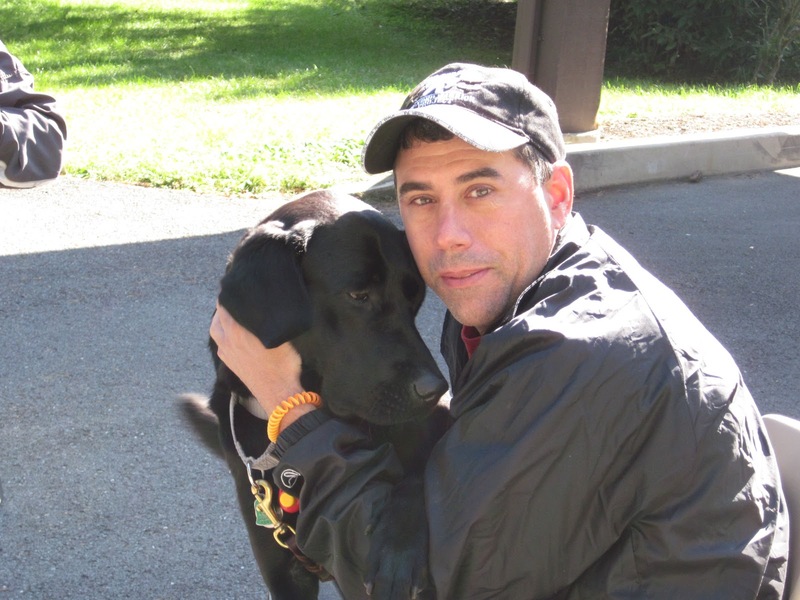 Our goal is to raise $20,000 – the actual cost of raising and training one service dog. Are you up for the challenge? Each one of our service dogs is specially trained to assist their partner. SSD Snow White assists a young man who uses a wheelchair. His bedroom is on the second floor, and in order to get up and down the stairs, he uses a mechanical lift. However, in order to operate the lift, someone needs to press and hold the button at the top of the stairs. With the assistance of SSD Snow White, he can easily move between levels of the house. Snow White has learned to assist him into the lift, go to the top of the stairs and hold down the button for the entire 45 seconds it takes for the lift to reach the top. Once in his room, she turns the lights and the speakers for the TV and brings him the remote. With Snow White’s assistance, he doesn’t need to wait for someone to help him. He can move around independently. You can make a difference in the lives of people like Snow White’s partner. Sign up today to walk for Susquehanna Service Dogs in the Highmark Walk! Can’t make it to the Walk? Be a virtual walker! Donate now to support SSD in the Walk. 5K starts at 9 a.m.